It was such a wonderful fall weekend! I hope you enjoyed the good weather (on Saturday least), maybe if you’re lucky enough to live in Boston you checked out the Red Sox parade and of course that extra hour of glorious sleep. Fall daylight savings is one of my favorite weekends of the year- your body thinks its late but you realize its early and you can roll over and go back to bed. There is nothing better! Except realizing that extra hour of sleep has also allowed you an extra hour for breakfast, my favorite meal of the day! Breakfast literally makes my day- I mean seriously, breakfast is the best in the morning… but who doesn’t love pancakes or eggs for dinner to? It’s the ultimate meal and it always makes me happy. It’s also a time where you can catch up or wind down with friends or alone with the morning paper. My best friend Connie and I always had crazy schedules when we lived together, but breakfast was our time to catch up, drink some coffee and start our day off right; if we had breakfast together, I knew it was going to be a great day. As a kid my mother used to make me baked eggs, they are simple but they are so satisfying and delicious. My favorite part about them? You pop them in the oven, set the timer and there ready before you know it! There is no worry or fuss like there is with scrambled, poached or fried eggs. Simple, easy and delicious- just the way breakfast should be on Sunday mornings so you can sit back and enjoy it with the ones you’re with! Red Bicycle Breadworks is a local Park City company. They sell their bread out of The Market in town and it’s totally delicious. Their gold creek cheddar bread is the perfect breakfast toast. They also make an amazing sea salt and olive oil bread that we’ve started calling ‘crack’ bread. We have to buy two loaves at a time because we inevitably eat one loaf before we even leave the grocery store- its that good (if you’ve had it you know what I’m talking about!). If you live in Park City I highly recommend checking out their bread- if you don’t (that’s too bad for you!) but any good fresh bread will do! Enjoy! Preheat oven to 375 degrees. 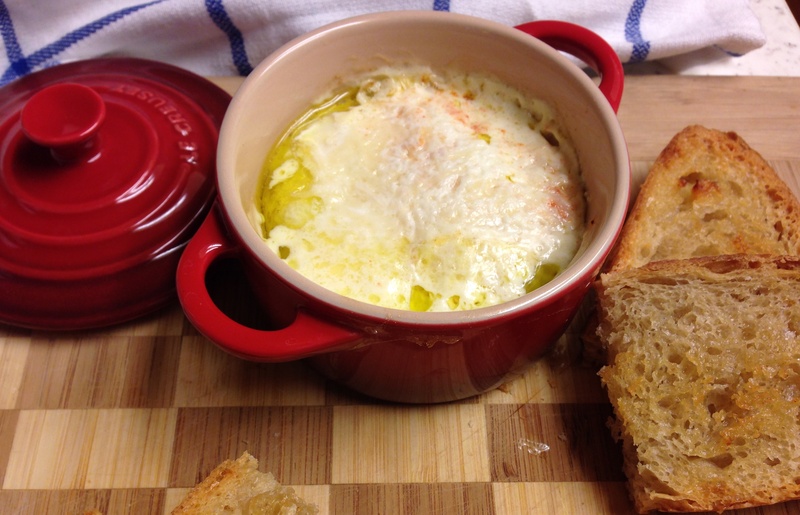 Put 1 tablespoon olive oil into the cocotte (baking dish, small tart pan or souffle dish), followed by the eggs and cream. Season with dash of paprika, salt and pepper. Cover with 1 tablespoon grated Parmigiano-Reggiano and bake just until the white is set, about 15 minutes. Serve with toast. 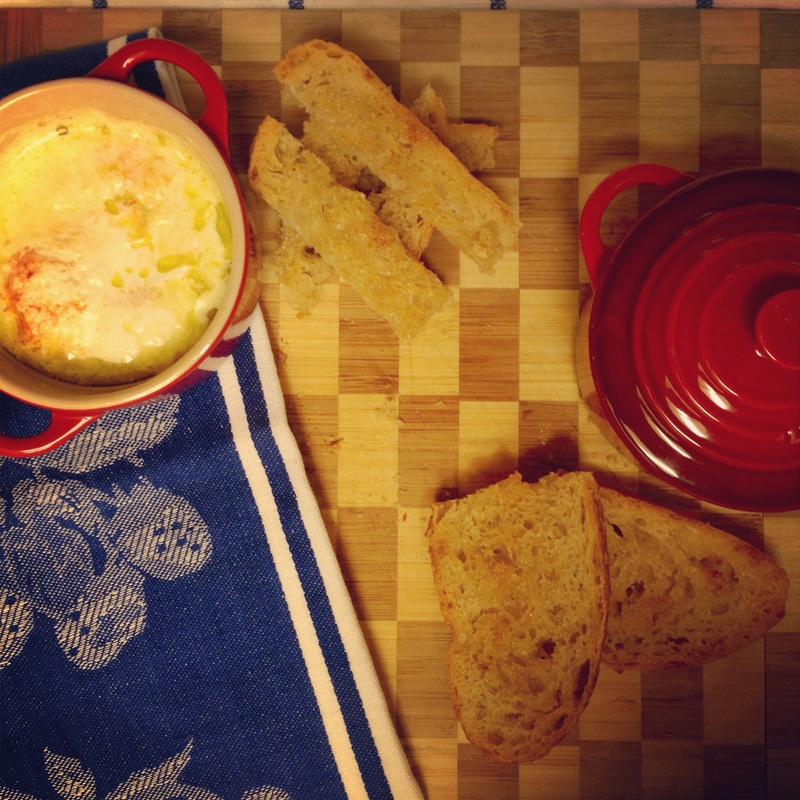 This entry was posted in Breakfast, Family Favorites, Recipes and tagged baked eggs, breakfast eggs, cheddar toast, easy breakfast, eggs and toast, red bicycle breadworks by skibootsinthekitchen. Bookmark the permalink. Bruce and I enjoyed your recipe for Corn chowder and biscuits….wonderful meal! !